ME Green’s four founders—Wajdi Habib, Lara El Khoury, Philippe El Khoury, and Thierry Laulom—are unlikely allies. They first envisioned and founded ME Green from different parts of the world. From Belgium, Wajdi and Thierry collaborated with Philippe and Lara on their new passion: green energy. Nicolas Leroy would also join the team later from Belgium and became a managing partner. In 2010, as Lebanon continued to suffer from unexpected power cuts, blackouts, fuel shortages, the ME Green team saw the potential to make an immediate impact through renewable energy. 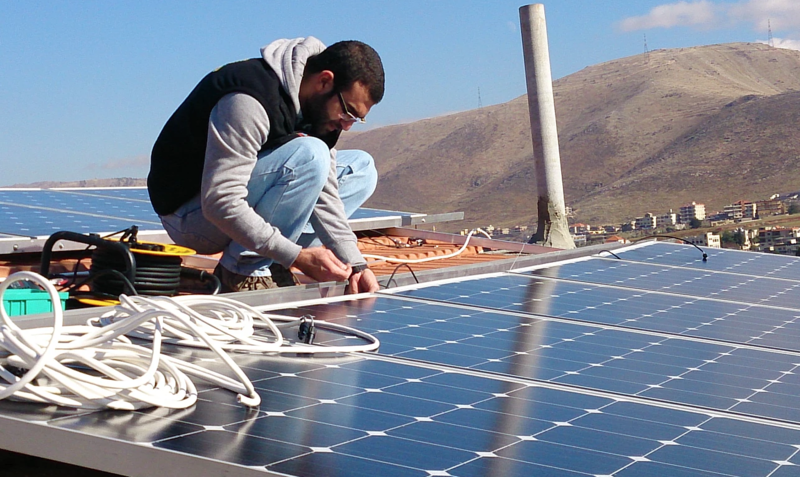 Small and medium-scale decentralized renewable energy systems provide practical solutions to Lebanon’s energy problems. Wind and solar energy solutions have the potential to empower people to directly access affordable, eco-friendly electricity. At the time, Lebanese communities had little to no awareness of how renewable energy could positively impact their own lives or the environment. Even though the concept of green business had not yet reached Lebanon, ME Green’s founders invested their time and money to grow their business from the ground up. ME Green’s team spent most of their time knocking on people’s doors and spreading the word about solar and wind energy. They pursued their mission of educating people about renewable energy through seminars and exhibitions.